Sri Chinmoy’s first call for custom-made ‘toys’ went out in August 1983 when he requested his students to make machines to help him increase his sprinting speed. 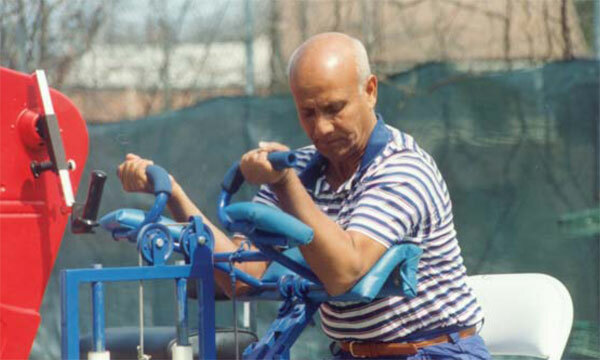 In 1985, Sri Chinmoy sent out the call once more, this time for machines that were: “cute, small, strong and yet look professional, but not too complicated.” For the next 22 years exercise machines flowed in from all quarters, with Sri Chinmoy usually stating which body part or muscle he wanted to concentrate on. These machines were bought or copied from existing machines, or were the products of his students using their imagination to make mediaeval-looking instruments out of wood, hinges and springs. As the years progressed, some of his students with engineering and welding skills began to make stronger and more sophisticated machines out of steel. As strange as some of these ‘toys’ may seem, they helped Sri Chinmoy to develop strength in every part of his physical body and this enabled him to do lifts that required tremendous, localized strength.